Great for those cooler summer nights, this Juicy Fruits Afghan is a great way to bring bright colors (and a little warmth) into your home. Made with brightly colored yarn, this crocheted afghan pattern also makes a great gift for teens and new apartment owners. The name really says it all - the bright colors make this a true delight. In fact, it can be displayed like real piece of art. Free afghan crochet patterns may not scream summer, but this project truly breaks the mold. Gauge: 2 shells = 4” (10cm) in pattern; 7 rows = 4” (10 cm). Beginning Cross-stitch (beg cross-st) = Dc in space after the sc and before the next 5-dc group one row below, ch 1, dc in space before the same sc and previous 5-dc group. Cross-stitch (cross-st) = Dc in next ch-space after next sc two rows below, ch 1, dc in chspace before same sc. There's never a bad time to start working on a free crochet pattern, whether it's a big afghan or a little accessory. The designs featured in 25 Quick and Thrifty Free Crochet Patterns are unique and fun to make. Give them as a gift or save them for yourself - the choice is yours. Either way, you'll be so glad you took the time to check out these free crochet patterns. When instructed to work into a stitch or space “2 rows below”, work into the row numbered 2 less than the current row. For example, if you are working Row 5, a stitch “2 rows below” is in Row 5 – 2 = Row 3. Row 1 (right side): Sc in 2nd ch from hook, *skip next 2 ch, 5 dc in next ch, skip next 2 ch, sc in next ch; repeat from * across; change to A, turn—Twenty-five 5-dc groups and 26 sc. Row 2: Ch 2, dc in first sc, ch 1, sc in center st of next 5-dc group, ch 1, *beg cross-st, ch 1, sc in center st of next 5-dc group, ch 1; repeat from across to last sc, 2 dc in last sc, turn—24 cross-sts and 25 sc. Row 3: Ch 3, 2 dc in first dc, sc in next sc, *5 dc in ch-1 space of next cross-st, sc in next sc; repeat from * across to last 2 dc, skip next dc, 3 dc in top of beginning ch-2, change to C, turn—Twenty-four 5-dc groups, two 3-dc groups, and 25 sc. Row 4: Ch 1, sc in first dc, ch 1, skip next 2 dc, cross-st, ch 1, *sc in center st of next 5-dc group, ch 1, cross-st, ch 1; repeat from * across to last 3 dc, skip next 2 dc, sc in top of beginning ch-3, turn—25 cross-sts and 26 sc. Row 5: Ch 1, sc in first sc, 5 dc in ch-1 space of next cross-st, *sc in next sc, 5 dc in ch-1 space of next cross-st; repeat from * across to last sc, sc in last sc; change to A, turn— Twenty-five 5-dc groups and 26 sc. Rows 6 and 7: Repeats Row 2 and 3; change to D in last st of Row 7. Repeat Rows 4-7 changing color in the following sequence: [2 rows each of D, A, B, A, C, A] 8 times, then 2 rows D. Fasten off. With right side facing, join A with slip st in first sc to work across st of last row; ch 3, 6 dc in same st as join, *skip next 2 dc, sc in next dc, 6 dc in next sc; repeat from * to last sc, 7 dc in last sc; working down long side and in ends of rows, **sc in space between next 2 B rows, 6 dc in sc of next color row, skip next color row;** repeat from ** to Row 1, 7 dc in the base of the first sc of Row 1; working across opposite side of foundation chs of Row 1, ***sc in loop below next 5-dc group, 6 dc in loop below next sc; repeat from *** to last loop, 7 dc in last loop; working up 2nd long side and in ends of rows, repeat between ** and ** to last row; join with slip st in top of beginning ch-3. Fasten off. 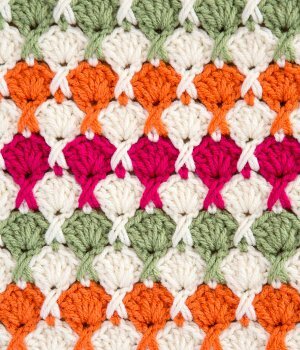 You don't have to be a baby to appreciate the designs of these easy crochet afghan patterns. In fact, 36 Free Crochet Blanket Patterns for Beginners includes a ton of fun projects that adults can curl up with, too. There's nothing better than a warm afghan in the winter, so start working on one of these patterns before the weather gets warm. These crochet afghan patterns make great baby shower gifts, too. The up close picture of this juicy fruits afghan was the selling point for me. It has such a unique design and that is something I value when selecting a new project. Furthermore, I am surprised that there are so few rows to master to create this work. There is no skill lever but I would mark this as intermediate because of the need to change colors. This was the perfect post to find to learn about the beginning cross stitch crochet stitch. I had to google the tern and was able to find a really short video that lead me to do more research. This is my new challenge to learn the cross stitch. I love this look and I think the new technique will be one that I will find uses for in the future. Isn't it fun to be an experienced crocheter and to still find a new stitch to learn? A shell stitch combined with the crossover "X" stitch will give such texture to this afghan. The name is just perfect! Many years ago Red Heart yarns used to be stiff and scratchy, but now you can find so many beautifully soft choices out there. Not only do the colors make this project exciting but also the stitches that incorporated the x in every other shell stitch. Thank you for having the pattern right on the same page. Convenient for crocheters. I love the look of this pattern, but would love to make a smaller version to give as a baby gift. I was wondering if you could tell me what the stitch repeat is. OH MY LAND... it' a lovely pattern! using the X stitch I just learned with a classic shell! BEAUTIFUL!! !